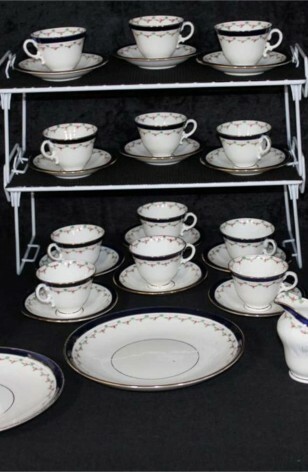 Antique-Vintage - Aynsley Fine Bone China, Pattern AYN191, Produced in 1934 to 1939, A (40) Piece Set. A truly Bright White Background on all Pieces, with Blue Floral on the Lip, along with Geometric Blue Band on the Edge of the Lip that looks like a Honeycomb design, with Dots and Greek Key. All Pieces have a Blue Rim. Antique-Vintage - Aynsley Fine Bone China, Pattern AYN191, Produced in 1934 to 1939. A (40) Piece Set.